Every day, I take the bus to and from my college. Being the curious person that I am, I’ve always preferred looking around and seeing things as I travel, so every time I have the chance to, I try to get the very front seat on the upper deck of the bus where your vision can extend from the streets below to the skies above. Around two weeks ago, I started noticing something new on the streets of Hong Kong. At first, I saw a light blue Pac-Man ghost made out of tiles stuck on a wall of an old building. Next, I saw some Space Invader art also made out of tiles on a footbridge. While these things did stand out to me, it never really occurred to me that it was a form of vandalism. They were all placed in highly visible areas and seemed more like an addition to the scenery rather than a nuisance. It wasn’t until I saw a huge Pac-Man on the wall of a hill – the same wall that I’ve seen being populated with graffiti throughout my years living in this city – that I was thoroughly impressed and finally became curious about the mastermind behind these new colorful works of art that brought a new vibrancy to our urban jungle. Taking out my smartphone from my pocket, I quickly Googled up “tile street art” and was pleased to find that the street artist I was looking for was at the very top of the results page. His name was “Invader” – I laughed at how the name fit him so well. 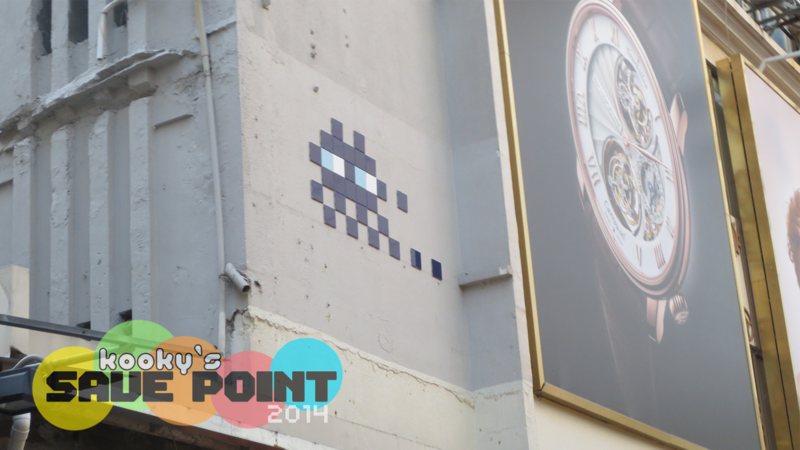 French urban artist “Invader” has been actively “invading” the world with his signature style of art. Using cement and tiles of various colors and sizes, Invader leaves his mark on the places he visits with pixel art inspired by retro games – mostly invaders from the famous 1978 Space Invaders arcade game. He counts the number of marks he’s left and gives himself a score for each city he visits. So far, he’s invaded over 30 cities around the globe and shows no sign of stopping. With this new-found curiousity to see more of his work, I decided to go a little scavenger hunt to see how many I could find while exploring the streets of Hong Kong. With the Chinese New Year holidays happening during the weekend, I decided to call up some of my friends to come join me for a whole day of adventure on February 1. We met up at the Fortress Hill train station and walked from there to Causeway Bay, going to places that I’ve only passed by while on a bus and looking at buildings or walls that I never cared to notice before. We went to Central by bus to do some more hunting and ended up catching the Chinese New Year fireworks in the evening. In total, I took pictures of 4 of his works on that day – missing 3 that I saw later on while riding home on a bus that I never usually take. 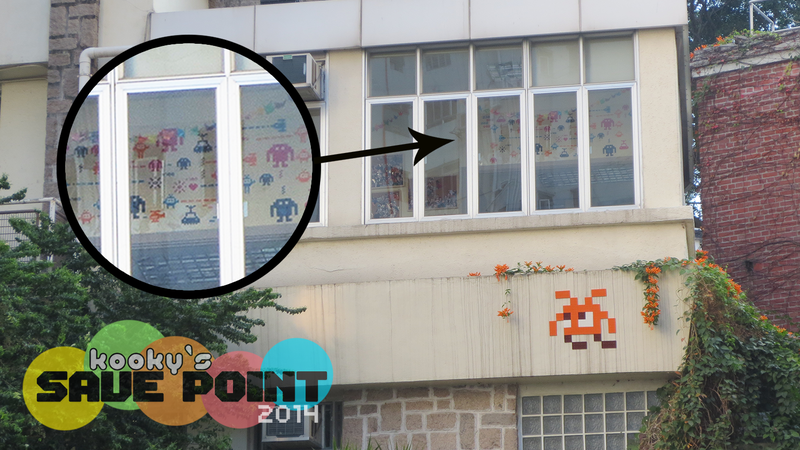 After seeing a number of Invader’s works on Hong Kong Island, I’ve really come to appreciate his style. He chooses his locations very carefully, making sure that the colors of his tiles and their placement don’t disturb the overall look of the area but are still able to bring new life to it. He is bold enough to put his illegal yet fun-filled art in highly public areas to bring some vibrancy in some of the duller areas of our concrete jungle. For me, the scavenger hunt is still on and I still continue to pay closer attention to my surroundings in hopes to see more of his work around town. He’s given me a reason to explore the streets with a more thorough approach and I’m actually learning more about city more than I have before. You’d think that after seeing a piece of art over and over again, you’d start getting sick of it. But even as I continue pass by Invader’s tiles while riding the bus to and from school, I still get really excited at the thought of seeing those colorful tiles again. If you’d like to follow the Invasion, Invader has his own website and regularly updates his Instagram. You can also check out South China Morning Post’s interview with him and some other pictures of his works in Hong Kong on Street Art News. This is refreshing. Great to read about games affecting a different cultural space and medium. Also, doesn’t hurt to read about this type of art’s presence in a world completely foreign (I’m assuming) to most of us readers. Love hearing about Hong Kong and the way it informs your articles. For instance, the fact that Sleeping Dogs actually captured the spirit of Hong Kong was quite surprising. Keep up of the good work. Nice Hajime avatar, btw. And, of course: Bird, Go! Thanks for commenting! It’s nice to know that my posts are interesting to other similar bloggers out there. Both the gaming and art scenes in Hong Kong are still quite young, so the culture here is quite different when it comes to those things. I’ll definitely be sharing more about the Hong Kong side of gaming and entertainment in the future. Probably going to write about the Animation-Comic-Game Hong Kong (ACGHK) convention during the summer.